Note: You may be wondering why we should be using biodiesel when we now have an abundance of fossil fuels. Well, the main reasons are 1) even though we have found new fossil fuel reserves, there is still a limited supply of fossil fuels and we are still using it up just as fast as we can produce it. And 2) biodiesel is a carbon nuetral fuel if fossil fuels are not used to produce it. This helps reduce greenhouse gasses being emitted into our atmosphere. This month's newsletter is all about the current state of the biodiesel industry. The people at World Peace Emerging have put together a great book that I very highly recommend entitled "The Rise of Biodiesel". It is very well researched and very professionally edited. The composition and graphics are the best I have ever seen in ANY eBook on any subject anywhere. You can download it HERE. Biodiesel use continues to grow and grow every year as the world learns "the hard way" that alternative fuels are going to be a fact of life now and in the future. As people continue to see a steady rise in fossil fuels and are educated on topics like global warming, peak oil, etc. you will see biodiesel becoming more and more popular. Jatropha use as a feedstock continues to rise especially in areas which are semi-arid in nature where food crops will not grow well. Oil Palm use, the crop with the highest oil content, continues to grow also. 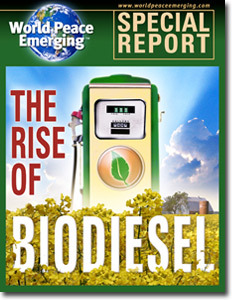 Slowly, but steadily, biodiesel is moving into the mainstream. The company that they used to create this project was Green Fuel technologies http://www.greenfuelonline.com . Their focus is on the power plant industry to help reduce CO2 emissions, but it is one of the examples that proves the viability of algae as a biofuel. Algea is almost a perfect candidate: the oils are extraced for biodiesel, the starches are extracted to make ethanol, the remaining proteins can be used in animal feeds or even as food for humans (I'm sure you have heard of the "blue-green" algae in pill form). 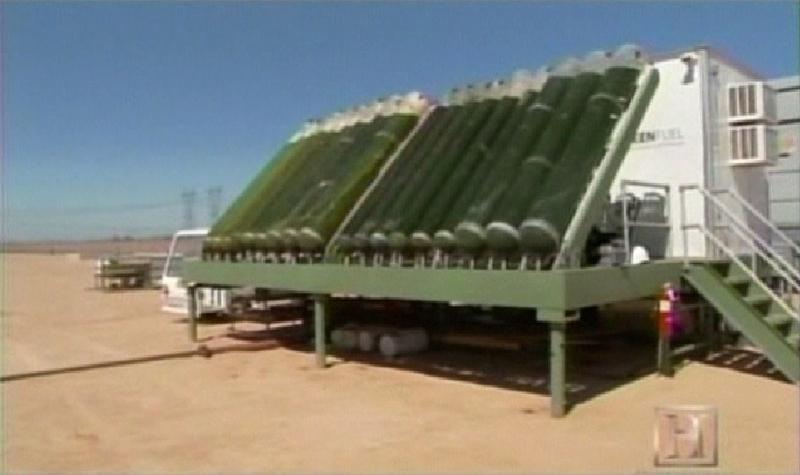 OR, the algea can be dried and burned in the power plant; Paper or plastic can be made from algae. Its only by-product is oxygen. It's on the bottom of the food chain, and extremely efficient at converting sunlight and carbon into life. This is not a fuel you can create efficiently in your backyard because of the acreage required, but it is still much better than corn (1.2 units of energy OUT for every one unit of energy IN) or palm oil (deforestation required in ecologically sensitive areas for plantations). Take a look at this NREL report: Note that on page two is the very reason why we don't have biodiesel from algae today: the program was squelched to pursue bioethanol (e.g. corn), most probably for political reasons. * It is estimated that the US transportation fuel needs were about 140.8 Billion gallons Biodiesel equivalent in 2004 (DOE), transportation being two thirds of total fuel consumption. * Roughly 15,000 square miles (9.6 Million Acres) would be required for algae production to produce that amount of fuel. * The Sonoran Desert covers 120,000 square miles. 12.5% of this area alone would be enough. * 66 Million acres (3%) of the US is land for urban use. And applying that to the DOE figures above for consumption based on converting all US fuel needs to equivalencies using biodiesel. (Mark's conversion). I could babble on, but you get the idea.